Cisco-Eagle Catalog - Fork Mounted Coil Ram/Lifter - 60&quot;L, 5-9/16&quot;Dia. Forklift Accessories > Coil Lifters > Fork Mounted Coil Ram/Lifter - 60"L, 5-9/16"Dia. Fork Mounted Coil Ram/Lifter - 60"L, 5-9/16"Dia. Add this 5-9/16" dia. fork mounted coil ram/lifter to your forklift and make moving coiled materials easier. This 60" long inverted lifter made from durable structural steel hangs the load centered between the forks for more effective coil transport. 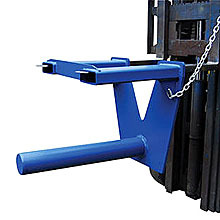 Safety retention chain secures lift to fork truck. Fork pockets are 7-1/2"W x 2-1/2"H. Capacity: 5500 lbs. Finish: painted blue. Size: 5-9/16"L x 60" dia.